The 37-year-old Gerhard-Hanappi-Stadion is expected to be demolished, while a brand new ground will stand partly on its blueprint. Because the pitch will be rotated 90 degrees north, the modern building will also consume one training field north of the old stadium, decreasing Rapid’s training centre to three fields. The enclosed bowl with vivid green cladding will be very simple and unified across the stadium, but with the exception of western grandstand. A tubular pavilion will be located there, becoming the most distinctive part of the design. Its southern façade will create a large, transparent crest of the club. One more interesting element is the single floodlight mast located in south-eastern corner of the new stadium. This will be a left of old Hanappi as a tribute to the previous stadium. It won’t serve as matchday lighting, though. All actual floodlights will be located atop the roof to minimize light pollution to nearby residents. Single-tiered stands will allow 24,000 people in the stadium’s European configuration, with seats only. However, early renderings clearly show the south end will be dedicated to most vibrant supporters and may function as a terrace. The new arena will have a very high percentage of premium seating. The main grandstand will have 2,500 business seats and a large number of 40 skyboxes, also joined by two large suites for banqueting. This infrastructure is hoped to make Rapid Austria’s best-earning club. However, the west side will also house club offices, megastore and museum. 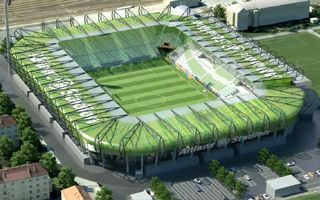 Demolition of the old stadium is expected to begin in the summer of 2014, while building its successor should take two years. This means we should see the stadium opened in 2016, after the club spends €53 million on construction. 40% of its budget will come from a Vienna city hall grant, while the remainder will be covered by Rapid privately. Significant naming rights contract will ease the club’s financial burden. As of July 2014 until mid-2025 the stadium will be called Allianz Stadion.